Help support your hometown symphony! The Salisbury Symphony is a professional symphony orchestra similar in size to those in Charlotte, Greensboro, Winston-Salem and Asheville, and yet it is home-based in the small town of Salisbury. We’re pretty unique, actually…. You may not be aware that only five other towns of similar or equal size in the entire United States can boast that they have supported a professional orchestra for 50 years or more. Our organization feels not only a sense of pride, but a sense of urgency about maintaining our legacy of fine arts in our area. The Salisbury Symphony exists to present high quality musical experiences to residents in our the region and to provide music education and outreach programs in order to strengthen the future of orchestral music. Simply put, our aim is to serve all ages in our community by promoting social and personal fulfillment through music. 1) Supporting one or more of our five major series concert events. As a professional orchestra, we must rely heavily on our supporters in order to support our efforts not only to hire talented musicans, but to bring unique musical experiences to our region. Some 40% of our annual budget must be raised from donors each year; ticket sales typically provide less than 25% of the revenue needed to support our symphony orchestra. 2) Supporting one or more of our education / outreach programs. Donations are used to provide teaching staff and music materials for students, as well as scholarships for some students who lack the means to participate in our programs. 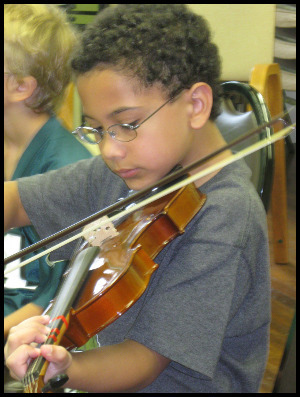 Our programs include After-School Strings, the Youth Symphony program and mini-concerts at each of our local area elementary schools. The Salisbury Symphony Orchestra receives support from the North Carolina Arts Council, an agency funded by the State of North Carolina and the National Endowment for the Arts.